Drew Call could use a job. Anyone in Salt Lake City hiring? Drew Call identifies as gay, but as a member of the Church of Latter-day Saints, he swore a solemn vow of chastity (Re: ladies only) in the face of relentless pressure from his Mormon overlords. Call, now 32, even married a high school classmate when he was 24 even though he had zero attraction to women. Marriage is taught by the Mormon Church as a means of curing one’s homosexuality. The couple even had children together. I imagine a fly on that bedroom wall would have been bored to death. In 2009, the couple divorced, and Call began inching toward life as an out gay man. This meant repercussions in the Church. 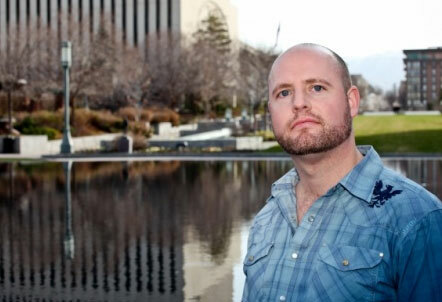 One Salt Lake City man, a church employee for more than a decade, is surprised and angered that he lost his temple recommend—a prerequisite for employment in the church—after he refused to give up his gay friends and was fired. But here’s the thing; in Utah this may not be entirely as illegal as it seems. In 2008 the LDS Church supported a statewide nondiscrimination law that would have made this type of firing against the law – as long as it didn’t happen in a religious institution. Churches firing people for perceived homosexuality is A-OK in the eyes of the Mormon Church. But is a church-run printing shop technically even a part of a religious institution? We may never know because Call isn’t suing his former employers. Instead, he’s spent the past year in search of a new job as he tries in vain to keep up with his child support payments. And really, that’s what this is all about. The Mormon Church would rather see children in their flock go without basic necessities, than employ a man who has gay friends. A man, who for all intents and purposes sacrificed the majority of his life living under false pretenses of heterosexuality and marriage. It’s not enough that they’ve ruined this gay man’s life. No, now they are inflicting their hate upon his children as well. Jerks.